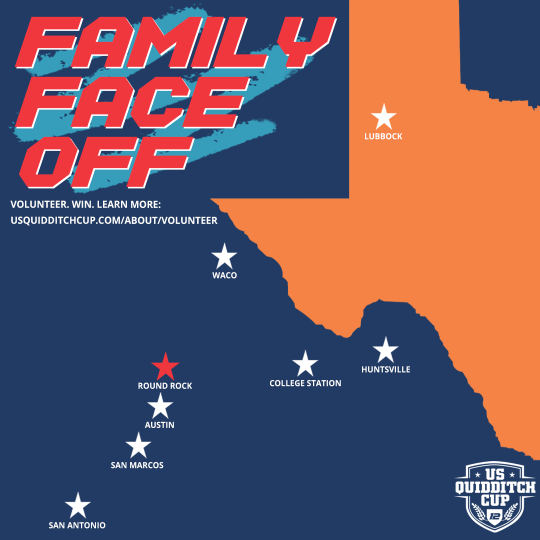 Announcing Family Face Off – a friendly competition among the Texas collegiate teams to see who can get the most family members to volunteer at US Quidditch Cup 12! To count for the contest, family members must sign up to volunteer between Wednesday, March 27 and April 3 using this sign-up form: https://forms.gle/N3bwCr6iYuedcFnz5. The sign up form will close at 11:59 pm ET next Wednesday. Volunteer shifts as short as 1 or 2 hours count, but if you want to give more, you can get free admission AND a free volunteer shirt with 3 hours. The college program with the most family volunteer hours will win an autographed copy of Quidditch Turns Ten! For any questions about the program, please email eventvolunteers@usquidditch.org.